​A talented multi-instrumentalist and vocalist, Lester started out playing drums with various rock groups in the 60s and 70s, notably Liberty, The Trolley Boys and Mango Tango. Switching to bass, and then finally guitar in the early 90s, Lester has fronted various duos, notably Bees Neez as a founding member, then Snapshot, New Tricks, and currently Back 2 Back. Performing in bands since the age of 14, Carlo first cut his teeth on rock 'n’ roll in his late teens as a member of various support acts for visiting Sydney and interstate groups. Since then, Carlo has been a member of several popular bands including Time in Motion, Scamm, Spotlight, Beez Neez, and most notably as founding member of band Mr Meaner. With Lester's rich baritone voice, and Carlo's rare three-octave vocal range, Back 2 Back will entertain you with strong harmonies, dynamic guitar solos, and an extraordinary variety of material. Their songs range from 60s classics from the Beatles, Rolling Stones and Roy Orbison, to foot tapping country-rock favourites from John Fogerty, to some of the 70s favourites in The Doobie Brothers, Eagles, Supertramp and Deep Purple, to the very latest foot stomping numbers from Foo Fighters and Guy Sebastion, plus ... not to forget the awesome 80s classics from Choir Boys, Cold Chisel, Angels, Men at Work, and ACDC. 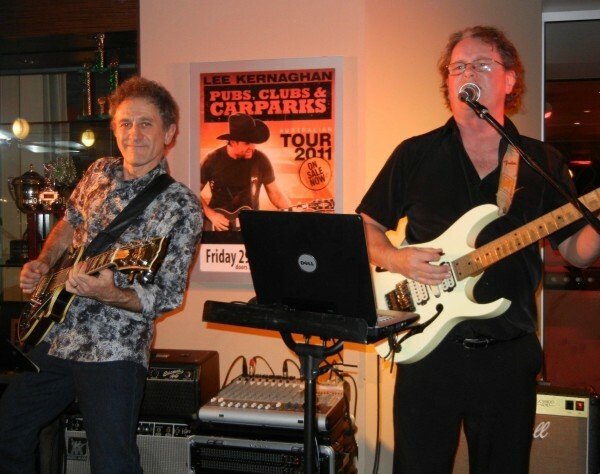 The duo is continually updating its repertoire, at the same time as filling its "bag" with a sprinkle of easy listening classics from the Shadows, The Everly Brothers, Elvis, and Santana, as well as Blues-oriented songs from Stevie Ray Vaughan, Robben Ford and Joe Satriani.